Scroll down for the Lift-to-Mate sequence of pictures taken by Carol Anne, and separately by me. This post tells more about the pictures in that post, and more about that day which was the final lift-to-mate in the shuttle program. 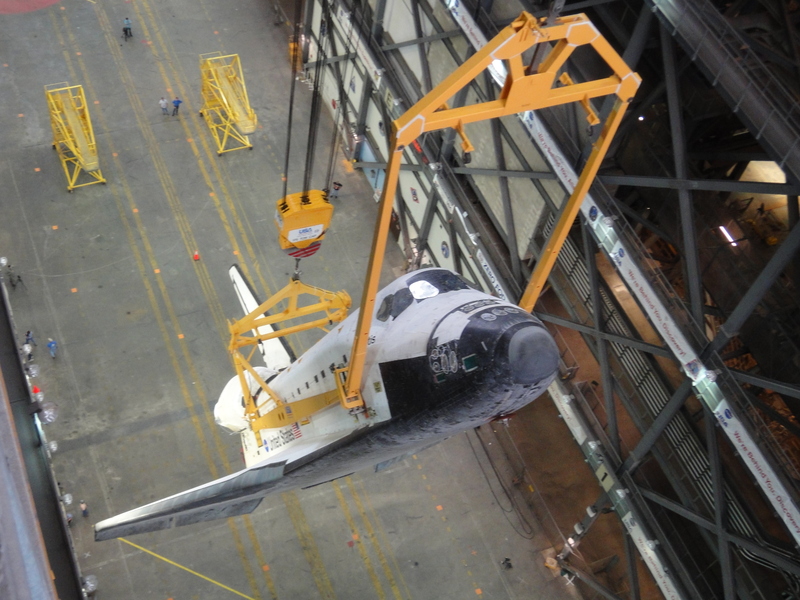 Carol Anne Swagler's photograph of the shuttle Atlantis suspended high above the floor of the Vehicle Assembly Building (VAB) on the afternoon of May 18, 2011. Ms. Swagler took this photograph and a series of others that appear in the Lift-to-Mate post below from the 16th floor while leaning out over the main bay of the VAB. The Atlantis would be lifted 500 feet to the ceiling of the VAB, then brought back down atop a 5-story Crawler and secured. This was the 135th and final lift-to-mate procedure in the shuttle program. The program will end when this shuttle lands after its scheduled mission in July 2011. Atlantis will then be retired and sent to a museum. About this Post. This is largely an inside baseball post in response to those wanting to know more about our VAB photographs in the post below, about how we took them, when we took them, and where we were in the VAB when we took them. 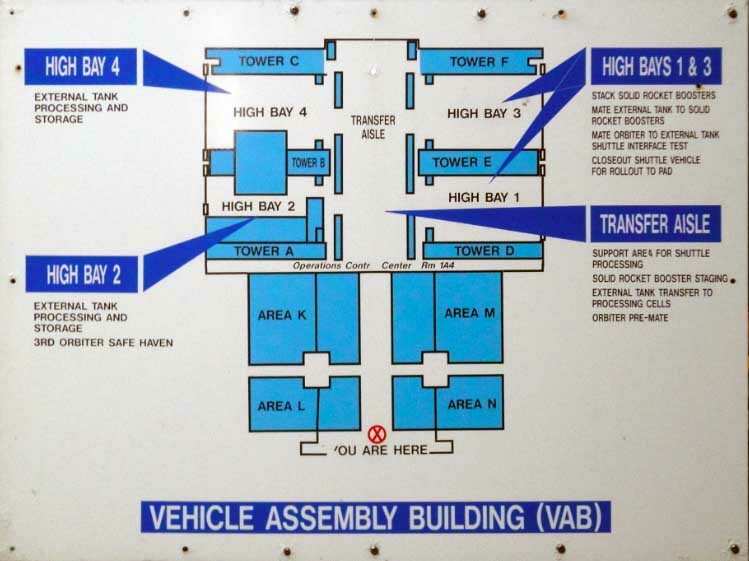 All of the photographs in the VAB lift-to-mate posts were taken by Carol Anne or me. None are NASA photographs, but you can access the NASA photographs HERE and they are excellent. Although, as noted below, we did exchange photographs with two other photography/video teams, we acquired their pictures — and they acquired ours — without any of us granting usage rights. The sole purpose of exchanging was to round each of our three film libraries which, because of the NASA restrictions on the access provided to different film teams, resulted in no one having the complete sets of photographs from the three locations (floor, 5th floor and 16th floor) they wished. The Carol Anne Swagler Photographs. In all, Carol Anne took 161 photographs from the 5th and the 16th floors of the Vehicle Assembly building on May 18, 2011. Additionally, she shot an extensive amount of video which has not yet been archived and timed. Carol Anne returned to the VAB in two different visits — one in the mid-morning photographing from the VAB floor, and a second shortly after noon photographing from the 16th floor. Her shots from the 16th floor were vastly superior to mine, and among the best taken because she had positioned herself at the end of the main VAB bay affording her a unique angle on the turning of the shuttle Atlantis upward to a 90-degree angle. Her shots are used exclusively in the lift-to-mate post below during the afternoon. My photos are not credited and are generally the morning and evening photographs. 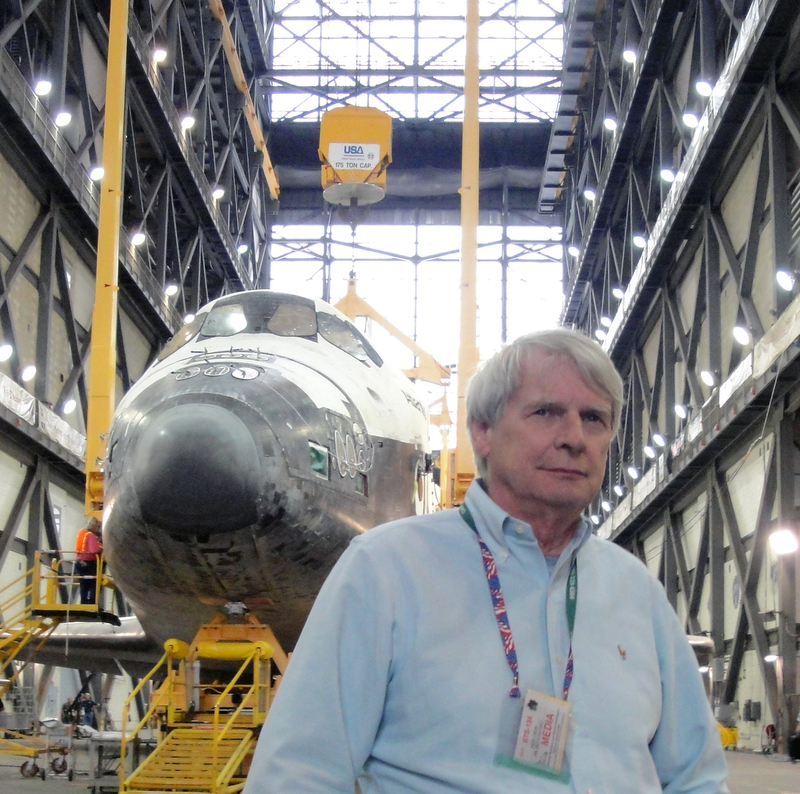 Pete Crow and the shuttle Atlantis on the main floor of the VAB on May 18, 2011. The Peter M. Crow Photographs. I would visit the VAB three times during the lift-to-mate. First I went over mid-morning (floor), and a second time after noon (16th floor). About 5 pm I returned for the evening and photographed from the floor, 5th floor and 16th floor until 9 pm when NASA Media ended the photo opportunity. In all I took 366 still photographs and shot 14 video takes totaling 10 minutes 13 seconds. In the morning we were both together on the main floor, and were again together during the afternoon, when the Atlantis was lifted and stood on end, when both of us were sent with the group that was on the 16th floor. The inability of the media to go between floors quickly, which often had been the case in the past, meant that we got no pictures of the shuttle from the 5th floor. On the other hand, depending on the lenses those on the 5th floor were using, they often never got complete shots of the entire shuttle as it was raised. The 16th floor by being parallel to the top of the main orange booster rocket afforded easy shots of the entire shuttle. 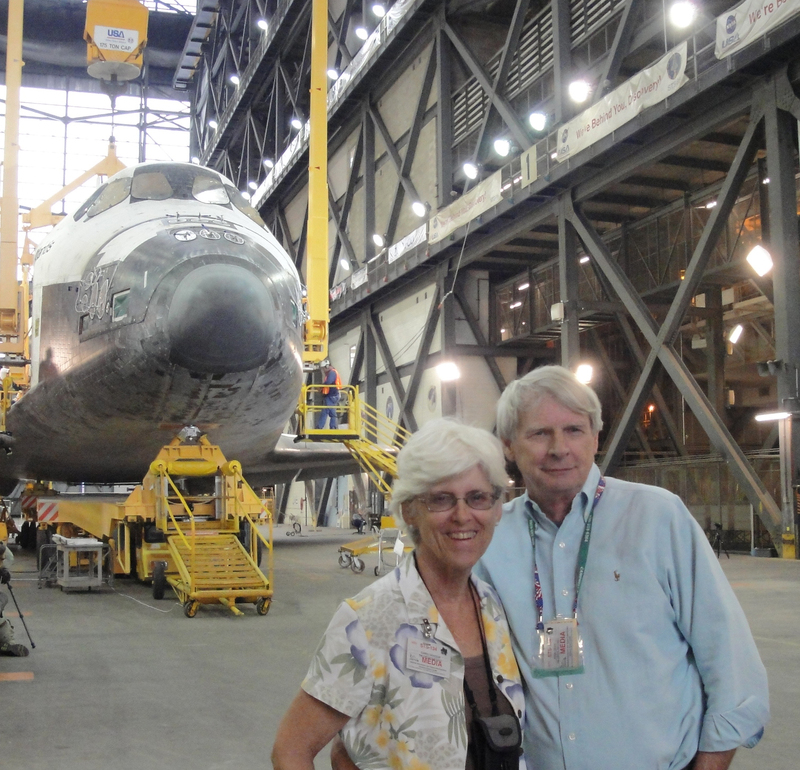 Peter M. Crow and Carol Anne Swagler on the main floor of the VAB on the morning of May 18, 2011. Photographers exchanged their photographs. In early evening, May 18, 2011, before returning to the VAB a final time, I exchanged all of my photographs from the day, and all of Carol Anne’s, with a film crew from Palm Beach, FL, and Bridgeport, CT. In return they gave us all of their video and photographs for the entire day, including their photographs from the 5th floor. As a result both they, and we, were able to round out our film libraries and make them complete. The 11 story evening climb.Many photographers who were working on the main/first floor decided to move to the 16th floor as the shuttle was lifted in the evening to the ceiling. Unfortunately, the elevator in the B Tower did not work. As a result about 20 photographers and their equipment, including me, were trapped at the 5th floor while the shuttle passed upwards and past the 16th floor where we had planned to shoot the lift. In the end, lacking any other way to get to the 16th floor, the trapped photographers climbed 11 stories from the 5th to the 16th floor. Most made it — I did — but the group of 20 quickly sorted out in the first several flights between floors 5 and 8 or 9 and many arrived too late to get photographs on the lift. By then the shuttle was hanging over the main bay nearly 500-feet up at the ceiling.